Named for its resemblance to a popular sweet treat in northern India, batasha sugar drops, this glowing globe-like lamp is a sweet addition to your décor as well. The elaborate pattern of small, translucent circles allows light to shine through causing the spherical lamps to give off a charming, ambient glow. Each circle is created using recycled glass, so it's also giving off an eco-friendly glow! Named for its resemblance to a popular sweet treat in northern India, batasha sugar drops, these glowing tealight candle holders are a sweet addition to your décor as well. The elaborate pattern of small, translucent circles allows light to shine through causing the small vessels they make up to give off a charming, ambient glow. Each circle is created using recycled glass, so it's also giving off an eco-friendly glow! A contemporary pendant light with a celestial design. Its spherical, oblong design offers a uniquely modern feel while its simplicity speaks to its versatility. In any room, this 100% post-consumer recycled glass pendant adds a touch of understated uniformity. Each piece includes a highly efficient LED bulb and is artisan-crafted in our Minnesota factory using reclaimed water, reused scrap materials in the production process and local recycled glass, which has significantly reduced our carbon footprint. A pendant light with character and poise. Its sleek, cylindrical form is accented with rounded indentations, which uniquely bend light around the room. This handcrafted pendant is a humble yet stylish addition to your home, and is hand-blown from 100% post-consumer recycled glass. Each piece includes a highly efficient LED bulb and is artisan-crafted in our Minnesota factory using reclaimed water, reused scrap materials in the production process and local recycled glass, which has significantly reduced our carbon footprint. Make a modern statement in any room. Its subtle hourglass body is designed with precision; every angle is smoothly rounded. With a look and feel of fluidity, this handcrafted post-consumer recycled glass pendant is timelessly versatile. Each piece includes a highly efficient LED bulb and is artisan-crafted in our Minnesota factory using reclaimed water, reused scrap materials in the production process and local recycled glass, which has significantly reduced our carbon footprint. Recycled and reborn. Glass is given new life in these 100% recycled vases. Recycled glass not only reuses material, it also helps protect natural resources and reduces demand for new, and its production is less impactful than new glass. The rich amber hue of these vases adds a touch of caramel color to your centerpiece or mantel. Recycled and reborn. Glass is given new life in these 100% recycled vases. Recycled glass not only reuses material, it also helps protect natural resources and reduces demand for new, and its production is less impactful than new glass. The rich amber stripe in these vases adds a touch of caramel color to your centerpiece or mantel. 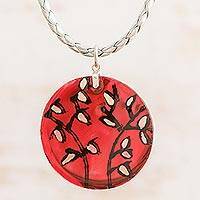 Against a passionate red body, floral motifs are painted by hand onto the round pendant of this necklace from Costa Rica. Grettel Sandoval crafts the pendant of recycled glass. This eco-friendly accessory is completed with sterling silver fixtures and braided leather cord. Multiple strands of waxed linen encircle the neck to culminate in a flirty beaded tassel. 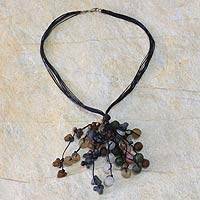 By Nonyem Abena Ibeneme, this delightful necklace combines globes of sese wood with beads of recycled glass in shades of jade, black, amber, brown, peach and ice. "Be charmed by this design," the Nigerian designer says.